I’ll be honest. This post is going to sound a lot like a high school English lesson. If you grasp this idea of Parallelism (Thought Rhyme) - it will help you unlock some of the beautiful mysteries God has hidden for you in His Word. Your left eye and right eye see slightly different images of the same object, and your brain combines those two images to form a single image that has an additional sense of depth that one eye alone cannot give. In the same way, Thought Rhyme gives two slightly different perspectives on an idea, and combining the two gives a deeper perspective. 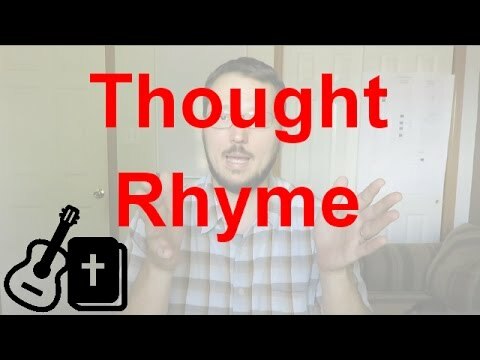 Let’s take a look at some examples, as well as the different types of Thought Rhyme. So you can make a connection between the “fullness of the earth” and “those who dwell therein” - that’s us, God’s people! This type of Thought Rhyme is called “Synonymous Parallelism” - that is, when the two thoughts say the same thing. Another type of is “Antithetical Parallelism”. This is when the two thoughts contrast each other. It’s like looking at two different sides of the same coin. E.g. I’ll leave it to you to meditate on that. Yet a third type of Parallelism is “Progressive Parallelism”. In this case, there is a natural progression of the thought - going deeper on the same thought line by line. Do you see the progression? Walking to standing to sitting. It’s like stairs that lead deeper down into a single thought. The second line is a result of the first line. But they are still directly connected. They are not independent thoughts. The two thoughts are sometimes not obviously connected. But because of the principle of parallelism, a connection can be made and insight can be gleaned. ​​There is no want to those who fear Him. Do you see the connection? Seeking the Lord is part of what it means to Fear the Lord. Again, these are not isolated statements. It’s not like the Lord takes pleasure in those who fear Him and those who hope in His mercy. This is parallelism at work, and you can combine these two slightly different perspectives into a single images. As a result, we can see that “hoping in His mercy” is yet another aspect of what it means to Fear the Lord. Again, if you really understand this principle, and observe it in the Scripture, it can fundamentally change the way you understand the poetry of the Bible. I'll be referencing this principle of Thought Rhyme often in the devotions on the Psalms, so I just wanted to take the time to introduce it properly. I hope it helps!